Ah, Oktoberfest. An event that somehow combines the best parts of Halloween, Disney World, a family reunion, and Beerfest into a one-month celebration. One of the few things larger than the fest itself is the aura surrounding it. Because I have a whopping 48 hours of Oktoberfest under my belt, I deem myself credentialed to separate the truths from the myths, the facts from the legends, and the moderately exaggerated from the ludicrously overstated. The tents that serve beer open at 10:00 on weekdays and 9:00 on weekends, but people line up much earlier to ensure they get into the tent of their choice as soon as the gates open. As the fateful weekend approached, everyone’s supposed wake up times grew earlier and earlier. “Dude, you better get there by 7:30 or there’s no way you’re getting in.” “My friends went last weekend and they said you need to be there by 6:45.” “I’m gonna set my alarm for 5:45.” I did not arrive before noon on either of the days I attended. And guess what? I still got into a tent. Yes, some waiting was involved, but not as much as there would have been had I woke up at some devilish time. Maybe I missed out on the fun of waking up and hating yourself for a couple hours. Oh well. You don’t really have to. But do it. Your life will be easier. I knew people who booked their trips the week before, but they seemed pretty stressed out trying to get all the logistics together. Also, many places, especially cheap hostels and nice hotels, sell out well in advance. My advice: once you know you’re going to study in Europe, link up with your friends who will also be in Europe and book the trip. It will make for a great European reunion. To me, this is probably the most exaggerated myth of all. There is so much more to Oktoberfest than the beer, which I was happy to see. In fact, Oktoberfest has activities for everyone. I saw people of all ages, including babies in strollers, at the fest. There are rides on rides on rides, a bunch of different types tents and exhibits, and almost too much different food to try. 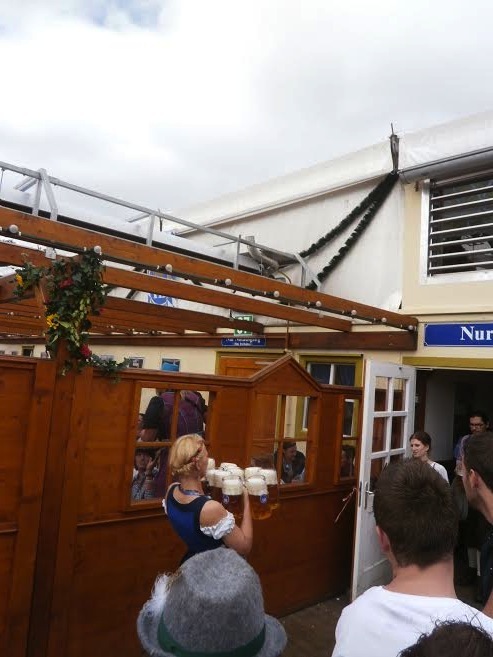 You could spend a whole day at Oktoberfest without approaching one of the beer tents and not see the entire grounds. Some friends and ventured away from the wildness inside the tents and checked out some of the rides. While beer is certainly not the be-all end-all of Oktoberfest, it certainly has a role. The beer is delicious, but more importantly, it comes in steins. Few things are more fun than drinking large quantities of liquid out of a massive German stein. 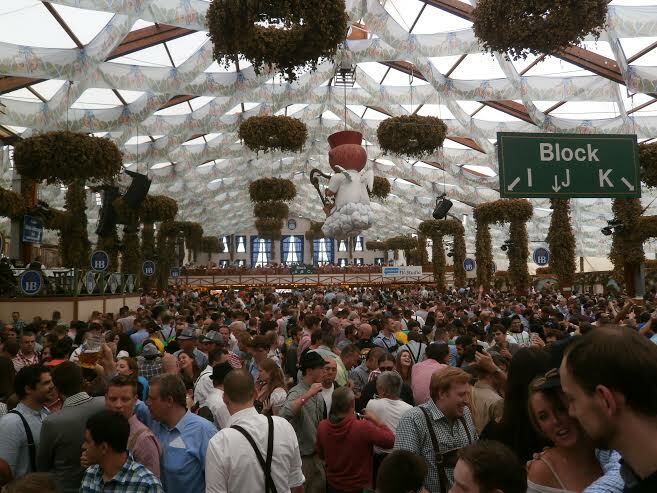 Most of the beer is served in gigantic tents, which have an unbelievable atmosphere. Thousands of people fit into these tents, and there is continuous singing and dancing on the tables. A personal highlight was when the large band played a great version of Sweet Caroline. Gigantic is not an understatement. Whenever I brought up Oktoberfest to a Czech or German, they all seemed to give me an odd smirk and a quick chuckle before responding. It’s actually amazing how they all do it the exact same way. I’m not positive, but I’m pretty sure it’s code for “Haha silly, naïve American. Look at you trying to be all cultural. You’re annoying.” I asked one German from Hamburg in one of my classes if he goes most years. Mistake. He legitimately laughed in my face, and said he never went and has no real desire to go. While there certainly was some celebration of German culture, Oktoberfest seems to be as much of a tourist event as anything else. The waitresses are absolute machines. They are machines partially because of their work ethic. They carry large amounts of drink and food, navigate through dense crowds, and practically never spill nor slow down. They are also machines in the sense that they will not stop to talk and they won’t slow down if there’s an obstacle. So if you’re in their way, uh, move, or you will get steamrolled. And don’t ever trying tapping them on the shoulders or getting their attention when they are carrying food. You could get yourself a good ole’ German tongue-lashing. And you won’t get whatever it was you wanted. Holding one stein is hard enough. These waitresses are constantly carrying eight. Eight! After months of build up, the hype surrounding Oktoberfest reached extreme levels. The anticipation began at UR last spring and carried through the summer. In Prague, it exponentially grew, as it seemed like someone was always talking about Oktoberfest. 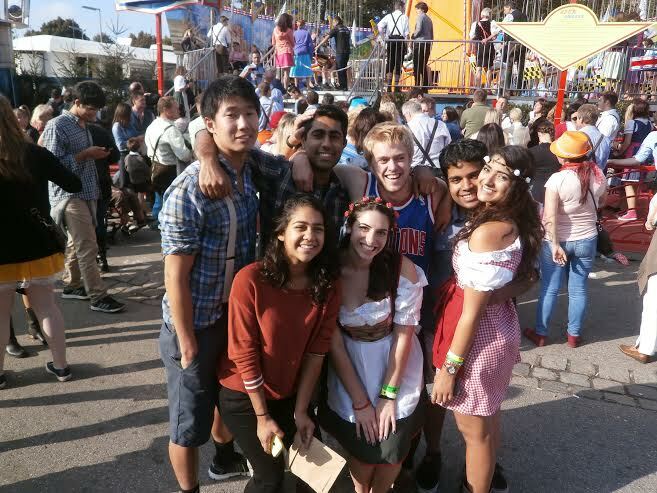 Despite the absurd amount of hype, Oktoberfest easily exceeded my expectations. There is just so much to do, so many people to see, and so much fun to be had. After Oktoberfest, most people who I spoke with about it said the same thing. 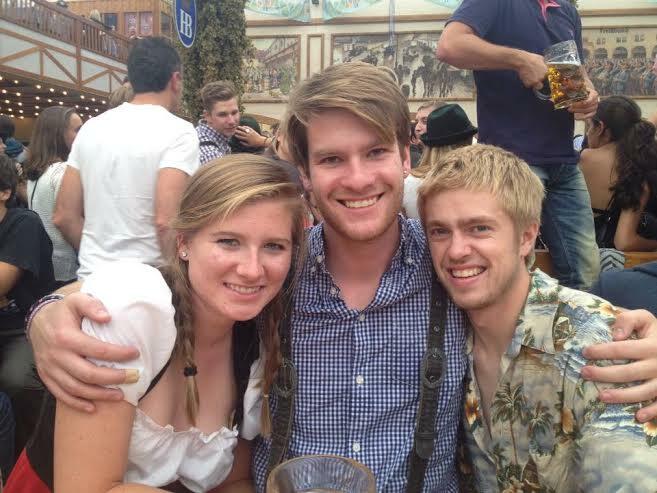 If you study abroad in Europe, you have to check out Oktoberfest. I must have mixed up my lederhosen with my Hawaiian shirt. Maybe next time I’ll get it right. 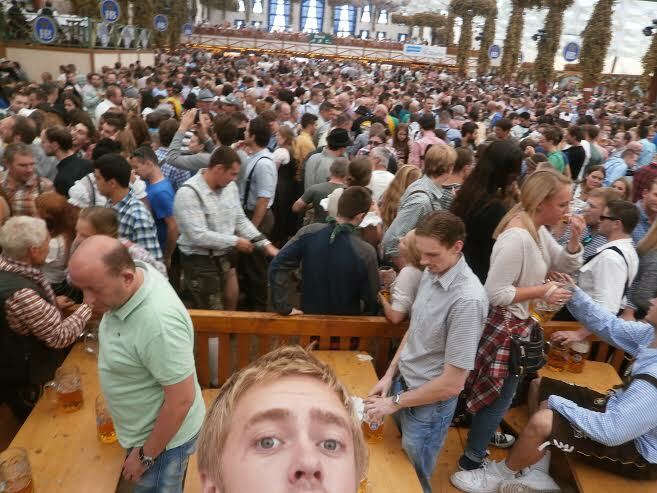 A few thousand of my friends and I at Oktoberfest. This entry was posted on Thursday, October 2nd, 2014 at 3:45 pm and is filed under Fall 2014, Jack in Czech Republic. You can follow any responses to this entry through the RSS 2.0 feed. You can leave a response, or trackback from your own site. guess we ARE talking about the Munchn’er Oktoberfest!